Given the bad rap that romantic comedies typically get it seems The Other Woman was bound and determined to make sure people didn't think of it as a film that fit squarely into that cardboard box and so instead first time screenwriter Melissa Stack took cues from 9 to 5 and The First Wives Club and smashed them together into modern day giving us a comedy of errors in which three women, all scorned by the same man of course, get together and plot their revenge on the sick schlub. Thus, this is the antithesis of the rom-com, the movie not where some hopelessly romantic woman falls for a man who seems to be the perfect fit only to find out he isn't and that she has been blind to the real man of her dreams who's resided three cubicles down for years now, no, The Other Woman is out for revenge on the fanciful relationship and instead wanting to make sure everyone knows how the wrong kind of infatuation can lead nowhere and that it's only the healthy kind that might offer more meaningful fulfillment in our little time on this earth. That said, you don't really go into a movie that looks like what The Other Woman is going to be and expect much and maybe that is exactly why I had a pretty good time at this one. The film sports a pair of hilarious leading ladies with chemistry to burn and a solid guiding force in director Nick Cassavetes (The Notebook, My Sister's Keeper) who seems to have a taste for the eclectic and in trying his hand at straight-up comedy for the first time in his career, for the most part, lands on his feet only to stumble a few times in the area of slapstick and poop jokes that feel too immature for the subject matter the film is inherently taking on. Everything about The Other Woman screams that it should be easily shoved into the chick flick doldrums (shiny New York City setting, jobs for all that make life a breeze, cheesy pop soundtrack, several montages) but in a slight turn of hand we find that the film ultimately is able to divert the clichés of this formula and show the growing and repairing of relationships between women rather than the more idiotic road of watching these sophisticated women fight over a man clearly below their standards only for one of them to fool themselves into thinking our central schlub here is still the one, still worth keeping around, while never nailing down the entire male species as one stereotype. 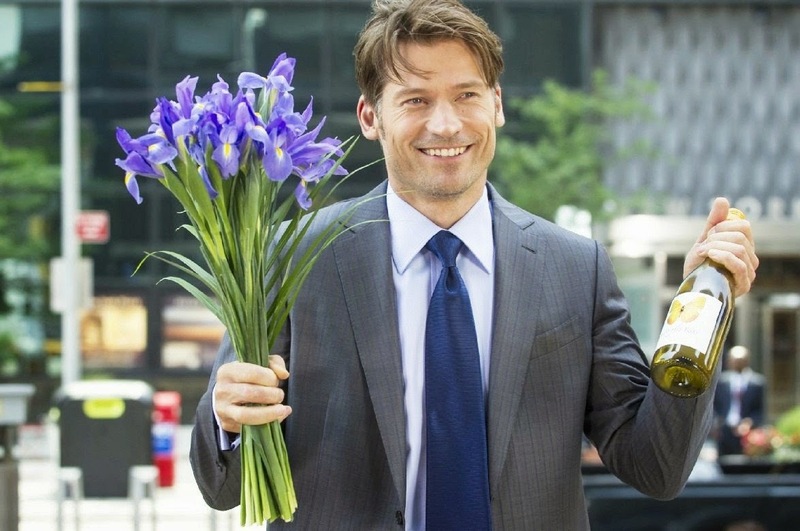 Mark King (Nikolaj Coster-Waldau) thinks he has everyone fooled in The Other Woman. We are first introduced to Mark King (Game of Thrones' Nikolaj Coster-Waldau) as the good-looking, successful New York businessman who seemingly has it all including a hot new romance with Carly Whitten (Cameron Diaz) a smart, pretty, no holds-barred lawyer who is all work leaving little time for play as far as real relationships go, but sees something different in Mark, a man she might actually see herself settling down with. She even gets to the point in the relationship she feels comfortable introducing him to her dad (Don Johnson), but when Mark fails to be there for her in this critical moment Carly gets the feeling something is off and naturally we already know what that "something" is and through a but of a contrivance Carly finds out as well. Venturing out to Mark's house she finds not his housekeeper but his wife, Kate (the great Leslie Mann) who before now, was resting peacefully in a large home she kept as her haven away from all the technical aspects of life that Mark took care of allowing her to decorate and shop all she wanted essentially playing the Stepford model to a T. Upon Carly's discovery that she has been sleeping with a married man and Kate's world-shattering discovery that her seemingly perfect husband has been cheating on her things begin to take turns into the unknown for both of these women and what happens next, thankfully for us, is pretty damn entertaining. Kate literally has no one to turn to, though she later confides in her brother Phil (Taylor Kinney) and we wonder why she ever leaned so heavily on Carly, but without this gut reaction we would have no movie so to find some kind of resolution in a situation where she never expected to find herself Kate shows up at Carly's work and then consistently keeps following her to find some unknown place of solace in the fact that Carly feels just as played as she does. When this happens and what I found odd and slightly appealing was that these two women, one of which is very headstrong, don't really have a plan about what to do in the situation and one might think this is where the movie would introduce its main plot point, but instead it just sits there for a while giving the pacing a stagnant feeling, but wisely using the time to invest in the real emotional repercussions of Mark's actions on both Carly and Kate. It is when a third affair is discovered with Amber (Kate Upton) that things become a little more hokey and a lot more formulaic. What is clear about The Other Woman though is that it wants to avoid this formulaic approach as much as possible and so when Upton's Amber is introduced and the film essentially becomes a game of ridiculous hijinks to get back at the man that has betrayed all of them it begins to flounder in its own grave. It had something interesting going on for a fair amount of time something that, were it not for the revealing trailers, I might have expected to do something else, but just because it becomes all the more obvious where this thing is heading, which again, isn't necessarily bad because where it goes is not only where we expect it to, but where we want it to (with a few narrative hiccups along the way) doesn't mean this is an intolerable film. The downside is that despite its attempts to subvert the genre it so clearly owes its archetypes and locations to it is unable to break free of them entirely. I enjoyed the story and I enjoyed the chemistry between the two lead actresses (more of which I'll get to later), but through all of that we are still meant to hit the predictable beats of beach locations, bonding moments over drinks with obvious song choices in the background and all too convenient alternate love interests for our principle cast to rely on once they've finished destroying the main course. There is even the sassy assistant cliché at play here, but at least she is portrayed by Nicki Minaj (which I initially looked at as another nail in the coffin) who turns out to be genuinely funny in her brief screen time. The need to see movies such as this conclude on the note we want them too is of high importance in such that it determines how much of the audience will perceive it as either satisfying or disappointing and if this were to end any other way than it does, most moviegoers would walk out displeased with these characters. The romantic comedy, chick flick or whatever kind of alternate you want to classify this movie as is not about the end game and never has been, but instead has always been about the ride you take to reach that point and if you become invested enough in the circumstances and care enough about the people and their feelings then that ultimate, albeit obvious payoff, is well worth the price of admission. In a nutshell, that was my experience with this film as it doesn't try to be anything innovative or necessarily fresh (clearly as we've seen several incarnations of this story before), but what it does try to do in terms of providing light entertainment that can be taken in and forgotten on an afternoon with friends is harmless and one could do much worse than a film headed by Mann and Diaz. Amber (Kate Upton), Carly (Cameron Diaz) and Kate (Leslie Mann) spy on their three-timing beau. All of that aside, what I did appreciate was that while the film clearly highlights this moment in time when these individuals love lives come crashing down around them, these women are more than just who they are in a relationship with (except for Amber, really, but that's part of the joke I think or at least I hope). Carly is a career-oriented woman, successful at what she does and clearly has no time to waste when she realizes a man isn't going to measure up to what she's looking for. I admired that she had no problem not calling Mark back after she found out he was married, that it was an absolute no and that she didn't hedge on whether or not her feelings for him meant more than her moral code. No, what he did repulsed her and she was done. As for Mann's Kate she has become so enamored with the thought of her role as a wife that she no longer thinks of herself for who she is and doesn't mind the endless days of shopping for olive oils, but through this experience she comes to realize her potential and her talents that were being buried before by this soul-sucking man who basically used her as an excuse to come off as a regular, stand-up guy, but who I doubt ever had genuine feelings for this woman. It is through the performances of these two women, the costume design by Paolo Nieddu and Jaqueline Oknaian (the shot of Mann sitting in a dark bar in a bright yellow dress speaks volumes) and the smaller, aforementioned moments where we see genuine emotion come from Kate and Carly on how they personally seem to deal with the situation at hand are what elevate the film. There are some great scenes that come from the interaction between Diaz and especially Mann that show the vulnerability these women still feel despite the front they enjoy displaying for others to see. There is natural, inherent drama in this scenario and Mann is able to play up those moments both for laughs while simultaneously bringing it back down in those times when she is reflecting on what was and what she expected it to be. The scene where she sits in her room in her wedding dress is a perfect example of how smoothly she can transition from reflection to foolishness without jarring the overall tone. As for the rest of the cast, Upton is mainly here to play the dimwit and kind of ruins the exclusive bond between Kate and Carly, but at the same time does offer up an interesting dynamic which most of the time is kept to a limited development so as not to expose the lack of acting ability on Upton's part. The Other Woman certainly doesn't break the mold and it may be mostly disposable, but it is charismatic and that counts for a lot in a total chick flick.